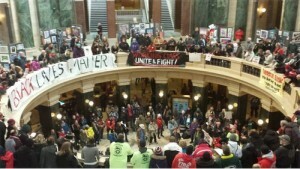 Protesters inside the Wisconsin State Capitol on Feb. 28. On Feb. 28, at a protest of thousands at the state Capitol here, Stephanie Bloom­ing­dale, secretary-treasurer of the Wisconsin AFL-CIO, called on all workers and community members to come to the Capitol in the coming week to stop the Wisconsin State Assembly from voting for a “right to work” bill. Many labor and community supporters participated in the Feb. 28 protest, including Fight for $15 activists trying to raise the minimum wage, youth, seniors, women, the lesbian-gay-bi-trans-queer community, environmentalists, faculty, students and the Black Lives Matter movement. Chants of “What’s disgusting? Union busting” and “Shut it down” were heard inside and on the streets around the Capitol. The deceptively named RTW bill really means the right to work for less, because it would seriously weaken workers’ unions and thereby destroy communities by making it hard for unions to collect dues. On Feb. 25, the Wisconsin State Senate passed an RTW bill on a “fast track” after shutting down a public comment session the day before. Of those who registered comments at the public session, 1,751 were opposed to RTW and 25 for — proof of overwhelming public opposition to RTW. But the Wall Street politician majority in the legislature are moving forward. The RTW bill must now be passed by the majority of the State Assembly before going to Gov. Scott Walker, an unabashed enemy of labor who has said he’ll sign RTW legislation if it comes before him. The Wisconsin AFL-CIO expects the Assembly to vote on the RTW bill on March 5. “This right-to-work-for-less legislation jeopardizes the future living standards of all workers, organized and unorganized, especially workers and communities of color, women and the LGBTQ community,” said Tommy Cavanaugh of Fight Imperialism, Stand Together (FIST) in Rockford, Ill. “RTW is yet another form of brutal, Greece-like austerity coming from Wall Street and being enacted by bought-and-paid-for politicians. Cavanaugh participated in a FIST, Workers World Party and Wisconsin Bail Out the People Movement delegation Feb. 25 to protest RTW at the state Capitol. 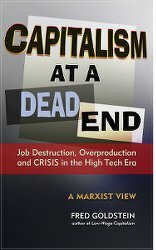 A series of events is being organized by the Wisconsin AFL-CIO and the Defeat “Right To Work” in Wisconsin coalition, with the support of numerous labor, community and youth/student organizations. On March 4, a Students and Workers, Unite and Fight! Solidarity Rally Against “Right to Work” protest will take place at the University of Wisconsin, Milwaukee. On March 5, a Fill the Capitol! Shut down “Right to Work!” protest will begin at 8 a.m. at the state Capitol.